An exhibition curated by Dr. Rolando F. Del Maestro, William Feindel Professor Emeritus in Neuro-Oncology at McGill University and Director, Neurosurgical Simulation and Artificial Intelligence Learning Centre at the Montreal Neurological Institute. Panel discussion, "Predictor Unveiled: The First Reliable Home Pregnancy Test & its Little-Known Connection to Montreal"
Who: Meg Crane (NYC - inventor of the Predictor), Prof. Jenna Healey (Queens Univ. ), Prof. Christabelle Sethna (Univ. Ottawa), and Prof. Alanna Thain (McGill Univ.) . Curiosities of Conception; Selections from the Osler Library of the History of Medicine. Place: Lobby, McLennan Library, 3459 rue McTavish, Montreal, QC, H3A 0C9. Duration: 24 January - 15 May 2019. Corps qui hantent d'autres corps. An exhibition featuring the work of 2018 Michele Larose-Osler Library Artist-in-Residence, Caroline Boileau, 4 February - 15 April 2019. "Universal medicine": Lessons from seventeenth-century England, Keynote address by Lauren Kassell, University of Cambridge, Angelical Conjunctions conference, 12 April 2019. Osler Day, featuring the Pam and Rolando Del Maestro William Osler Medical Students Essay Awards and the 41st Annual Osler Lectureship, 7 November 2018. The Fabric of the Human Body" (Vesalius, 1543): Images and Icons for the History of Medicine, Lecture by Hélène Cazes. Presented in collaboration with Le Département de langue et littérature françaises and Rare & Special Collections, Osler, Art, and Archives(ROAAr); supported by the Social Sciences and Humanities Research Council of Canada, 30 October 2018. De musei fabrica, Exhibition in collaboration with Text’art, a group of six Montreal fibre artists, and the Maude Abbott Medical Museum, 17 May - 20 August 2018. Materia Medica, Exhibition by Loren Williams, December 13, 2017 - 4 May 2018. Book Launch: Physicianship and the Rebirth of Medical Education, by J. Donald Boudreau, Eric Cassell, and Abraham Fuks, April 26, 2018. Jean-Martin Charcot and the “Caesarism” of the Faculty of Medicine, Lecture by Dr. Bernard Brais, sponsored by the Medical Students' Osler Society, April 17, 2018. Oslerian Treasures: The Father of Modern Medicine, Lecture by Professor Faith Wallis, sponsored by the Medical Students' Osler Society, February 5, 2018. Impossible pathologies: re-fragmenting the archive, Exhibition by Lucy Lyons, October 12 - December 12, 2017. The Gendered Cultures of Beer and Cheese: the Regulation of Human and Microbial Bodies on the Home and Industrial Scales, 1616 - 2017, September 11 - October 2, 2017. Vaccination: Fame, Fear and Controversy, 1798-1998, January 2017 - August 2017. A History of Neuro-Oncology: Candaian Savoir Faire, a talk by Dr. Rolando Del Maestro, MD, PhD, William Feindel Emeritus Professor in Neuro-Oncology, Director of McGill Neurosurgical Simulation Research and Training Centre. This talk encouraged discussion surrounding ideas and individuals that have shaped the world of neuro-oncology, while placing emphasis on Canadian neuro-oncology research. Attendees were encouraged to prepare a ‘Canadian Neuro-Oncology Minute’ that highlighted an individual’s contributions to historical and/or current advancements in Canada and received an autographed copy of Dr. Rolando Del Maestro’s book A History of Neuro-Oncology (2008). 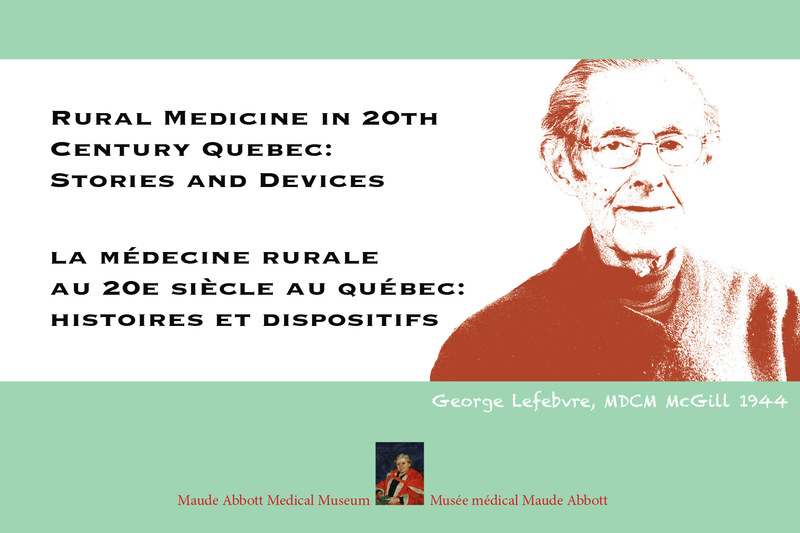 Rural Medicine in 20th Century Quebec: Stories and Devices, curated by Dr. Richard Fraser, Laura Sang, Joan O’Malley, Marc Provost, Jerry Xie, Meriem Bounnab and Lucy Luo. October 2016 - January 2017. Knowing Blood: Medical Observations, Fluid Meanings, curated by Darren N. Wagner and Nick Whitfield. January-September 2016. Sanitizing Style: Germ Theory and Fashion at the Turn of the Century, curated by Cynthia Tang and Anna Dysert. September-December 2015. On the Surface/Skin Deep, curated by Sylvie Boisjoli and and Shana Cooperstein. Read exhibition talks from the curators in the spring 2015 issue of the Osler Library Newsletter (no. 122). Follow link to an interview with the curators on our blog. The Literature of Prescription: Charlotte Perkins Gilman and The Yellow Wallpaper. A Biography of Neurasthenia in the late 19th and early 20th Centuries. Curated by Prof. Andrea Tone. September - April 2014. Designing Doctors: an exhibit talk by Professor Annmarie Adams, McGill School of Architecture. Tuesday, 7 May 2013, 1:00-2:00, Meakins Auditorium (5th floor McIntyre Medical Sciences Building). "Neurological Laboratories” to Interdisciplinary “Centres of Brain Research”: Otfrid Foerster, Wilder Penfield, and Early Neuroscience in Breslau and Montreal. Nickerson Fellowship talk by Dr. Frank Stahnisch, Thursday, 2 May 2013, 2:00 - 3:00, Don Bates Seminar Room 101, Department of Social Studies of Medicine, McGill University, 3647 Peel Street. Artistic Practice Scientific Vision: British Artistic Anatomy in the Late Eighteenth and Early Nineetenth Century, the catalogue to the exhibit curated by Dr. Allister Neher. Our Friend the Sun: Images of Light Therapeutics from the Osler Library Collection, 1901-1944, a lecture given by Dr. Tania Anne Woloshyn (Recorded January 24, 2011). This recording is made possible by a generous gift from Gail Beck, O.Ont., Med’78 and Andrew Fenus, MLS’74. Osler Library Lecture: A Relationship Etched in Time: Leonardo da Vinci, the Earl of Arundel and Wenceslaus Hollar, a lecture given by Dr. Del Maestro (Recorded January 10, 2011). This recording is made possible by a generous gift from Gail Beck, O.Ont., Med’78 and Andrew Fenus, MLS’74. Our Friend, the Sun: Images of Light Therapeutics from the Osler Library Collection, 1901-1944, the catalogue to the exhibit curated by Dr. Tania Anne Woloshyn. Margaret Ridley Charlton - Pioneer Medical Librarian. The first person with library training to work at the McGill University Medical Library and, with William Osler, one of the founders of the Medical Library Association. Our Friend the Sun - Images of Light, a lecture given by Dr. Tania Anne Woloshyn (Recorded January 24, 2011). A Relationship Etched in Time: Leonardo da Vinci, the Earl of Arundel and Wenceslaus Hollar, a lecture given by Dr. Del Maestro (Recorded January 10, 2011).